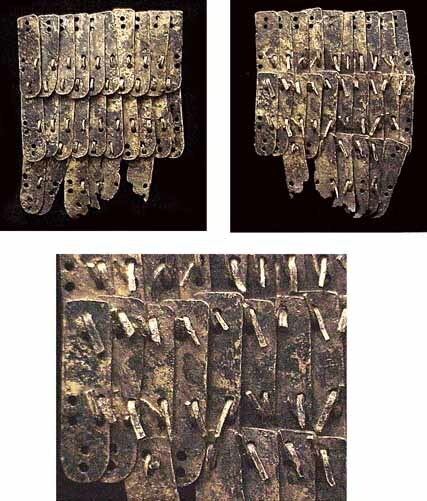 Armor of small metal scales sewn to a fabric backing was known to the Romans as lorica squamata. It is typically seen on depictions of standard bearers, musicians, centurions, cavalry troops, and even auxiliary infantry, but could be worn by regular legionaries as well. A shirt of scale armor was shaped in the same way as a lorica hamata, mid-thigh length with the shoulder doublings or cape. It is possible that the shirt could be opened either at the back or down one side so that it was easier to put on, the opening being closed by ties. Much has been written about scale armor's supposed vulnerability to an upward thrust, but this is probably greatly exaggerated. The scales were wired together in horizontal rows which were then laced or sewn to the backing. Therefore each scale had from four to 12 holes: two or more at each side for wiring to the next in the row, one or two at the top for fastening to the backing, and sometimes one or two at the bottom to secure the scales to the backing or to each other. (The type of armor in which the scales are laced to each other and need no backing at all is known as lamellar armor, while to confuse the matter there is also "locking scale" in which the scales are wired together without a backing. It can be difficult to tell what sort of armor a single scale might have come from, and that the Romans did not necessarily have different terms for each type.) The typical scale had a vertical pair of holes at each side near the top, plus one or two holes at the top. A large fragment of iron scale or locking scale armor, probably the collar cape from a lorica squamata, was found at Carlisle early in 2001. For an X-ray of it, see the Carlisle Millennium Project armor page, http://www.carlislemillenniumdig.co.uk/pages/armour.htm. (The object at lower right is probably the cheekpiece from a cavalry helmet, with the bright rectangle on the part covering the ear.) 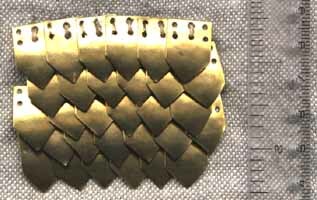 Other samples of Roman scale armor are shown on the Roman Hideout site, http://www.romanhideout.com/armamentarium.asp, and at the Online Collection of Roman Artifacts, http://www.roman-artifacts.com/. Fragments of the heavy linen backing have survived, in one case apparently padded with straw to give more protection from the ends of the wires that connect all the scales. Leather has also been suggested as a backing, but there is no direct evidence for it, and it may not have been as suitable as linen. 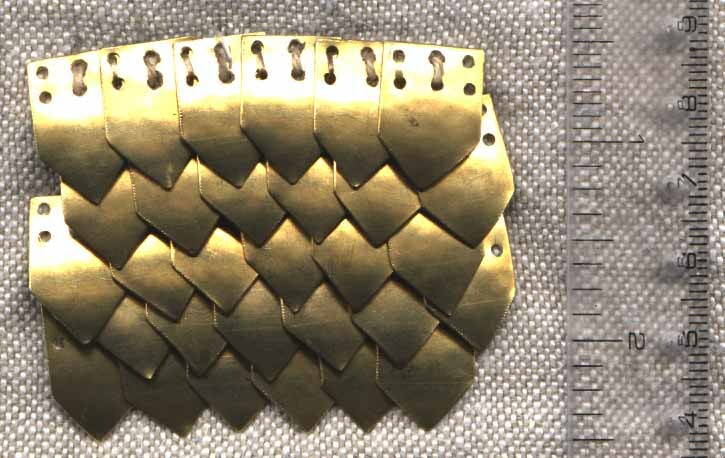 Another variation is lorica plumata, a Roman term generally used nowadays to refer to fine mail with an outer covering of scales. Several examples of this have been found, always with the smallest of rings and scales. The top of each scale is bent back at a right angle, and 4 holes are punched through it, through which the rings of the mail pass. This type of armor seems to have been reserved for officers. A beautiful reconstruction is worn by Dan Peterson in his book, Roman Legions Reconstructed in Colour Photographs. Another illustration of a centurion in scale armor is on the Organization and Officers page. "Lorica plumata" may actually be simply another Roman word for scale armor, or particularly for scales with midribs--a more "feathery" appearance. Construction of a lorica squamata starts with cutting out thousands of scales. Once the armor is complete it must be maintained, as it will rust or tarnish very easily and is difficult to clean unless it is tinned. It may also have a tendency to shed scales. With pointed scales it is a VERY good idea to dish the bottom half slightly. This makes the points lay down as shown above, and keeps the whole shirt from being a danger to the wearer! The biggest question about assembling a lorica squamata is how everything was arranged around the neck and shoulders. On some illustrations the scales seem to start in a complete circle around the neck, pointing outwards, but below the arms they neatly merge into straight rows that run around the body. This would be tricky to arrange, because the overlapping requires you to start from the bottom and work upwards. But with regular horizontal rows you have the problem of what to do at the shoulders, where the top two rows of scales meet top edge to top edge. At right is a piece of original lamellar or "locking scale" owned by David Michaels. It is made of brass and probably dates to the third century AD. The upper two photos are approximately life size, and show the front and back of the piece. The lower photo is an enlargement of the back, showing the flat wires or staples which hold the scales together. The thickness of the metal is roughly 20 gauge or .032". Corbridge 14.2mm, 9/16" 9.9mm, 3/8" 0.25mm/.010"
Corbridge 13.6mm, 11/32" 7.3mm, c. 9/32" 0.25mm/.010"
Great Chesters 12mm, c. 5/16" 7mm, 9/32" 0.25mm/.010"
Caerleon 9.5mm, c. 3/8" 9.5mm, c. 3/8" ? Vindobona 14mm, c. 9/16" 10mm, c. 3/8" ? Carnuntum 14mm, c. 9/16" 8mm, 5/16" "slight"
Dura Europas 9mm, c. 11/32" 6.5mm, 1/4" 0.25mm/.010"
At right is shown one possible way to cut out scales quickly with little waste. The longer the strip, the fewer "half scales" there will be, though a few may be needed anyway for edges, etc. Cut the sides of the scales first, shown here as the vertical lines, then do the 45 degree angle cuts, each of which will detach a scale from the strip. Daniyal Steelcrafts is developing a lorica squamata, and their prototype looks excellent. Deepeeka also offers scale armor, but the fabric backing may be cotton denim or some sort of synthetic blend, unless this has been improved recently. Deepeeka was offering loose scales, in several nice styles and sizes, brass, steel, or bronze, but it is not known if these are still in production or not.